PROPOSALS for the Woking Coign Church and Bouygues development on the outskirts of the town centre have now been submitted. It is the same revised application that was revealed in June, comprising a single 12-storey residential block and two smaller three to four-storey buildings, housing a total of 85 apartments. There is also underground parking and the site is to incorporate an 850-seat auditorium. Residents of Vale Farm Road and Oak’s Road weren’t happy about the plans at the time. They said the plans were ‘ill-conceived’, there was insufficient parking and the one-day-only display had been ‘misleading’. 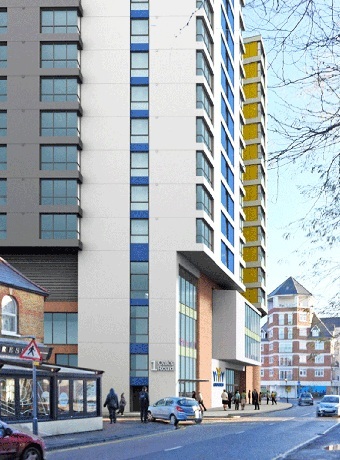 The £4 million site designs have been back and forth to the drawing board since 2006 when the church proposed a 13-storey block of 161 flats, which was rejected. Earlier this year, residents and local councillors were angry when another bigger Coign Church and Bouygues application for the site was revealed. It comprised 170 apartments across a 20-storey tower, and a 17-storey high rise with a 1,000-seat auditorium in the basement. Residents complained that no provision for infrastructure had been made for the already congested area. When a petition started gathering pace, the plans were sharply withdrawn in April. Although residents fully embrace the idea of regenerating the area and church, they had been shocked by the height of the proposed buildings, and the density of traffic and parking such a project would bring. French firm Bouygues say the newly submitted plans will enable the church to continue to expand its important work in Woking and the wider community, including help with meals for homeless and unemployed, parental support and training, youth and children’s meetings, and bereavement support. Nicolas Guérin, Managing Director of Bouygues Development, added: “Our team have been working hard to respond positively and form the design for the development. Malcolm Kayes, Senior Pastor of the church, said: “We are very pleased with the design and hope it is well received by local planners and residents. We have been really encouraged by many supportive comments regarding the Coign Church and its community provision and activities. When the News & Mail questioned the allocation of parking spaces, a Bouygues spokesman said: “There are 82 spaces in the scheme; it has not yet been decided how they will be allocated. “The number of spaces is appropriate to the development given its town location and how close it is to the train station and other public transport facilities. The mix of apartments is also more suited to smaller households such as singles and couples, who are less likely to own cars.